ECAM Lyon has been perfecting the art and methods of training engineers since 1900. This engineering school has always been able to provide its students with a human and scientific perspective of all major world changes whether economic, technical or industrial. This vision has allowed the students to face the challenges of a constantly changing industrial world. The school’s history is closely linked both to Lyon, where it settled just after the war at a time when the city was in major industrial growth, and to the history of the LaSalle network to which it belongs. Indeed, ECAM Lyon would not be the school it is today without its LaSallian roots – the source of its educational and teaching foundations. It is thanks to these very foundations, care for others, respect, solidarity and commitment, that ECAM Lyon stands out from other Engineering schools. To study at the ECAM Lyon is to learn the fundamentals of science in a pragmatic way. The school is committed to putting the student engineers in real-life situations as early as possible to enhance their employability. Innovation has always been at the heart of the training programs. The school’s values are also to be found in its Personal Development training. Social, humanitarian and charitable activities are encouraged to develop personal investment and excellence in the service of others. The ECAM Lyon staff and engineers are ambassadors for this philosophy. They ensure that it is passed on to all the students as soon as they join the school. Today, true to its heritage, ECAM Lyon shares these values with all the school personnel and trains ethically aware engineers who are open to the world and conscious of the economic constraints in business. The Brotherhood of Christian schools, a teaching congregation founded in the 17th century in Reims by Saint Jean-Baptiste de la Salle, traditionally provided elementary education; business and technical education followed. 45 students in each year group from 1912 onward. In September 1914, Reims was bombed, the cathedral was on fire. At the end of the First World War nothing remained of the School. 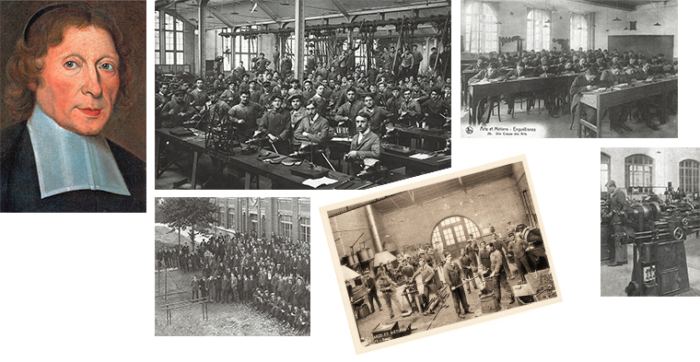 In 1919, the students were grouped together in the School of Industrial Mechanics and Electricity in Erquelinnes and both schools were merged to become the “Arts et Métiers School of Erquelinnes and of Reims” (A.M.E.R.). The number of students increased to 65 per year group at the beginning of the thirties. In 1940, during the Second World War, the school withdrew to Lyon and in 1946 made the decision to stay there permanently. The school expanded from 1947 to 1958 adding new workshop buildings, laboratories and student residences that still exist today. The programs continued to develop: the initial 3 year training period was increased to 4 years in 1952 then to 5 in 1962. In 1970, there were 80 student-engineers in each year group, all destined for jobs in the mechanical, chemical engineering and nuclear power sectors. In 1977, the Brotherhood handed their legacy over to the ECAM Foundation that gained recognition as a Public Utility, Non-Profit Organization. The school was placed under the responsibility of a Board of Directors, with representatives from higher education, ECAM engineers and Christian School Brothers. During the 80s, renovation work was carried out on the buildings and the programs turned more towards technical applied sciences. In 1992, ECAM became the first school in the Rhone-Alpes region to launch work and study programs. In 1995, in partnership with ITII Lyon, the first ECAM year group graduated – 34 ECAM engineers specialized in Mechanical Engineering. In 2004, the ECAM group was created with the Louis de Broglie school in Rennes (today called ECAM Rennes). In 2006, the group expanded to include the EPMI and then, in 2010 ECAM Strasbourg Europe. 2014: Opening of a new ECAM Lyon center on Reunion Island offering a preparatory year for the work and study Engineering program ……and the same in Ambérieu en Bugey in 2015. With its wealth of tradition and pride in its specialities, ECAM Lyon is preparing to enter a new decisive stage in its development – and has committed to a development plan to span 2015/2025.